Hey, saw this online last night, and I know I’ve seen a few others looking for something like this. 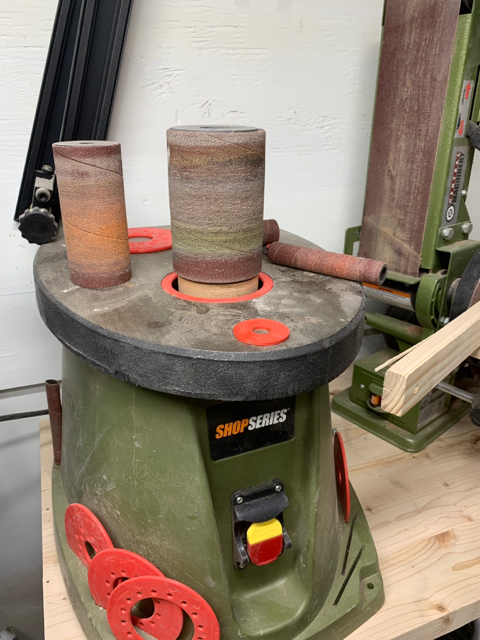 It’s a real simple modification to an oscillating spindle sander that sets it up for use with a template. I’m going to give it a try. Cool! Thanks for passing that along. I don't do any fancy riser work, but was just thinking it would be nice to speed up the process, accurately. If there was an award for the best/most helpful post of the Month/Year I would vote for this one! I have also been trying to figure out how to do this without destroying my oscillating drum sander. It is so simple I'm surprised that I hadn't figure it out. If I'd known that I would live this long I'd have taken better care of myself. I know. I was in the middle of getting ready to be getting started on the edge sander mod adding a new table and having the drive drum flattened. I switched gears and ordered stuff from amazon to make this happen. I’m pumped. 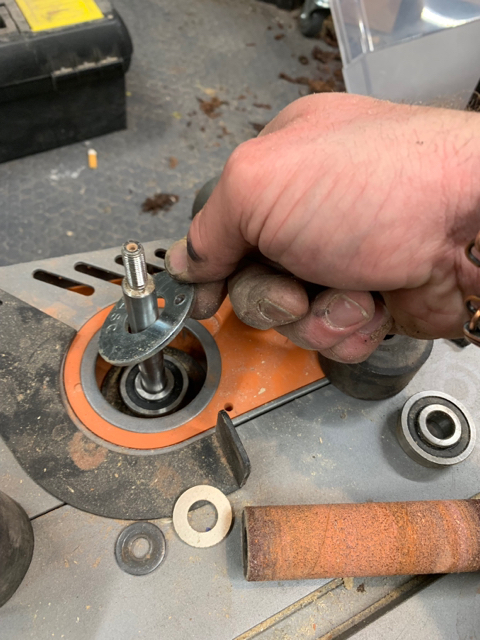 so after the extra spacer and the bearing he obviously had to shorten the rubber cylinder and the sanding sleeve accordingly, otherwise it would have been above the thread at the top of the shaft. 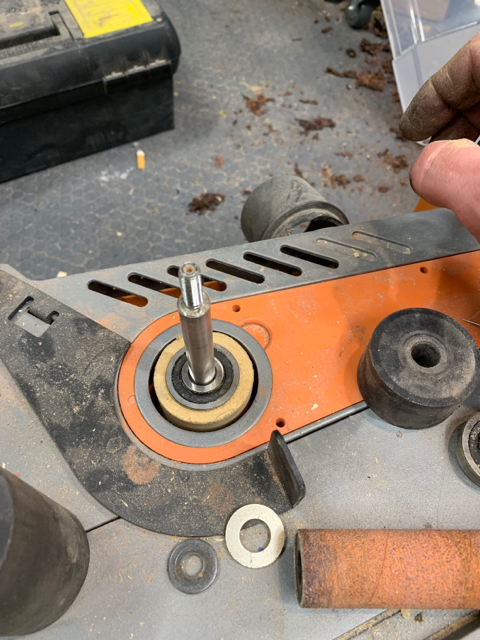 i opted to remove the oscillating function from my spindle sander when i did mine- as i was concerned about the movement damaging the super thin fades on my risers. i have since heard from other folk that the oscillation didnt damage their fades. not disputing their findings at all, i think i would just feel comfortable without the oscillating feature. I got a spindle sander awhile back that apparently has the belt that needs to be removed to stop it oscillating. I’m working on this now, though. I started trying to make one for a 3” drum. Got flange bearings with a 1/2” bore and a 1 3/8” OD, dug up a 3” and 1 3/8” hole saw, and cut out of a piece of polyethylene plastic and some mdf. The 3” hole saw made a 3” hole, though, which left my donut a little too small. I’m doing a 2” drum now with a 2 1/8” hole saw. 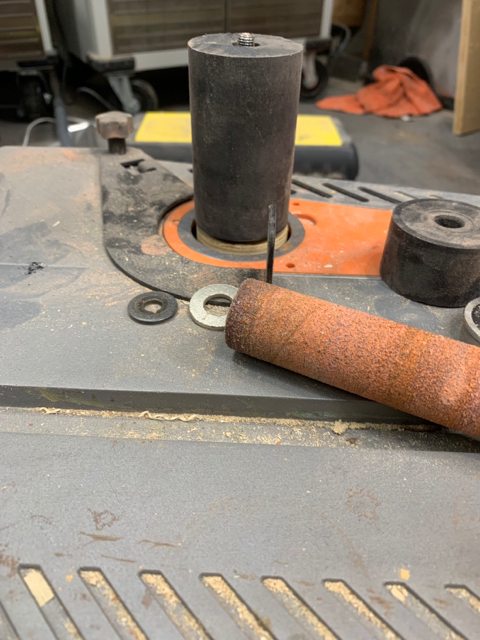 I got a spindle sander awhile back that apparently has the belt that needs to be removed to stop it oscillating. I’m working on this now, though. I started trying to make one for a 3” drum. Got flange bearings with a 1/2” bore and a 1 3/8” OD, dug up a 3” and 1 3/8” hole saw, and cut out of a piece of polyethylene plastic and some mdf. The 3” hole saw made a 3” hole, though, which left my donut a little too small. I’m doing a 2” drum now with a 2 1/8” hole saw on a rigid oscillating belt/spindle combo. The exact sizing is going to take some tweaking. I don’t understand why none of the sanders come with the option to turn off the oscillating feature. I understand it’s integrated in the drive system, but it seems like they’d install a way to disengage the belt at least. looking good mike- cant wait to see it working!! to disengage the oscillating feature on your "shop series" is a tad more than just removing a belt- if its anything like mine- looks to be exactly the same machine- just different colour. I would like to know how to disengage on the other machine. I think the same sander is branded 3 or 4 different names. That setup is slick! Where did you get the insert? Yep, very good idea. 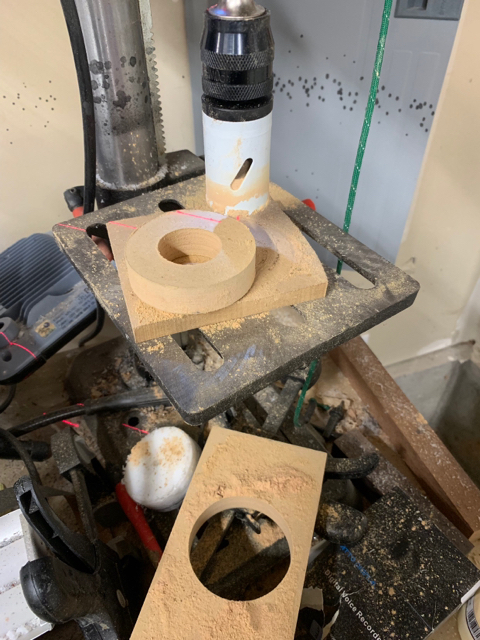 Same method (principle) as a pattern router bit. Mike- i had a local guy with a lathe turn it up for me. i selected the 2" as my sleeve of choice- and built the collar to suit- it obviously doesnt spin, but then it doesnt wear out against the template either- i drilled the holes for the dust extraction. i also had to shorten the sleeve about 1/2". i keep meaning to do a more detailed build along- showing the whole process- just time is in short supply. to disengage the oscillation- when you open it up- you will see its a pretty smart system. there are two discs on the shaft, with nodes or bumps on them- they are driven off the same drive but one disc has more teeth on it than the other so it just rotates marginally faster than the other one and as these discs and the shaft spin at your grinding speed- the top disc rotates slightly, very slightly faster than the bottom one- so as these two discs spin, they rotate against each other- and when the nodes align- the rubber sleeve lifts, and when the to discs valleys align with the nodes on the bottom disc, the sleeve descends. 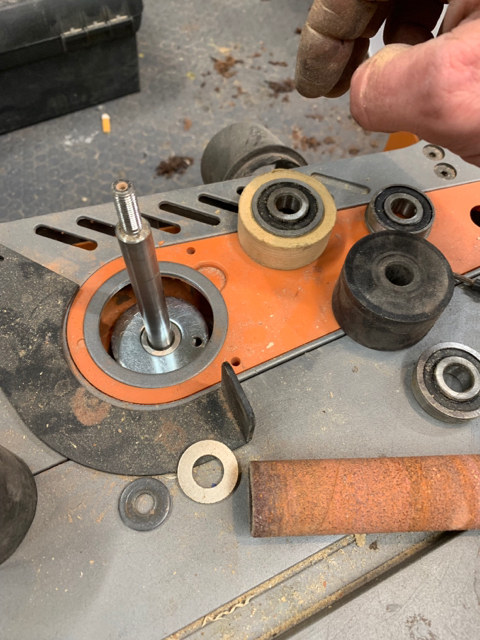 all i did was remove the top disc, and replaced it with a piece of copper pipe as a spacer so the rubber sleeve bottom washer and assembly sat against that . now there are no bumps or valleys to lift and lower the sleeve. i should have had a better collar turned up- but it was late at night- and it was what was handy- and its worked fine. you know mike- maybe you are right- maybe if the belt spinning the top disc was removed- it would not spin faster than the bottom one- and the two discs would just mesh into each other- and they wouldnt oscillate. that may be an option, but i just didnt want the centrifugal force to cause the top disc to move slightly, and to cause any oscillation. maybe if one could find a way to hold the two discs together- some self tapping screws, or maybe some zip ties- may be worth looking at.